At the Specify first corner: and Specify opposite corner: prompts, click to place the text in your title block — or anywhere you want. The Text Editor tab appears on the ribbon and you see the text editor in your drawing. Inside the text editor, right-click and choose Insert Field to open the Field dialog box. From the Field Category drop-down list, choose Objects. Under Field Names, choose Object. 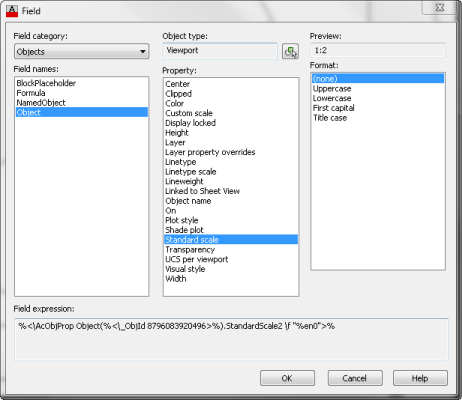 To the right of the Object Type box, click the Select Object button. Back in your drawing, select the layout for which you set the scale. You can only select one object. The dialog box returns and the Object Type box reads Viewport. Click OK to close the Field dialog box. Click outside of the Text Editor to place the text of the layout’s scale. Your Mtext now shows the scale of the viewport as you see at the right. Double-click the text to activate the Text Editor. Right-click and choose Update Field. Especially useful if you don’t lock the VP and someone adjust the scale or worse if someone unlock the viewport and then adjust the scale. Much neater solution – especially when combined with the drawing properties fields in the title block, even more efficient across multiple layout sheets. Yay Ellen! I have a block with attributes I insert to label views in our drawings. I have often wanted to be able to have a field that updates for the view scale. With attdia set to 1, I now can use your method on the scale attribute in my block to set the scale to the viewport scale. Cool, thanks. What if you have a drawing with multiple viewports, you will need a title block with multiple scale fields? This is a great tutorial. I just keep having one issue: It will display the scale with “_XREF” behind it. How do I resolve this issue? How do you get it to read N.T.S. instead of the actual scale? Maybe you can make a custum scale with the name N.T.S and a scale like it is used on the Original layout. Or make a wipeout and paste a new text N.T.S over the Original scale. Thank you for a simple, easy to implement solution. My AutoCad drawings just became soooo much easier to update.